Belt Mount The Belt mount is the most popular holster among competition shooters, a secure hold that is designed with a curve to fit comfortably on the hip. The Belt Mount will accommodate either a 1.5” or 2” wide belt. Once belt width is widened to 2” it cannot be changed back. Paddle Mount The Paddle Mount is the answer to anyone who wears many different styles of pants. You no longer will have trouble feeding the holster around your belt loops. The paddle slips over the belt and inside the waistband for a comfortable, secure fit that is quick and easy to put on or take off. With vents in the paddle portion this is a cool and comfortable option. Drop-Offset Comp-Tac has worked for years on the best way to fit each person’s shape and size. The drop offset is the answer. The Drop-Offset piece is specifically designed to help set the pistol away from the body and drop it to a lower position for a more comfortable draw. Designed with a cross brace to keep stable during the draw, the Drop-Offset is ideal for lady shooters whose waist and hip measurements may make proper holster fit a challenge. Cant The holster is designed with 8 mounting holes which allow it to be configured for a straight/speed draw, an FBI cant, or a cross draw rearward cant. 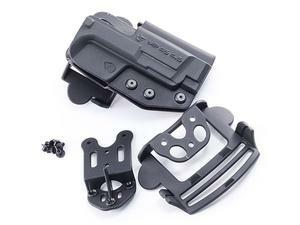 Easily changeable, the holster is compatible with many mounting systems offered by other holster manufacturers. Belt Width Mounting hardware will accommodate a 1.5” or 2” belt width, once the adjustment tab has been removed it cannot be reattached.